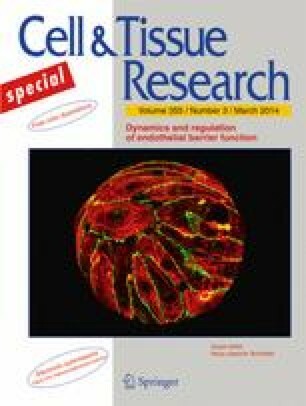 The vascular endothelium is a cellular interface between the blood and the interstitial space of tissue, which controls the exchange of fluid, solutes and cells by both transcellular and paracellular means. To accomplish the demands on barrier function, the regulation of the endothelium requires quick and adaptive mechanisms. This is, among others, accomplished by actin dynamics that interdependently interact with both the VE-cadherin/catenin complex, the main components of the adherens type junctions in endothelium and the membrane cytoskeleton. Actin filaments in endothelium are components of super-structured protein assemblies that control a variety of dynamic processes such as endo- and exocytosis, shape change, cell–substrate along with cell–cell adhesion and cell motion. In endothelium, actin filaments are components of: (1) contractile actin bundles appearing as stress fibers and junction-associated circumferential actin filaments, (2) actin networks accompanied by endocytotic ruffles, lamellipodia at leading edges of migrating cells and junction-associated intermittent lamellipodia (JAIL) that dynamically maintain junction integrity, (3) cortical actin and (4) the membrane cytoskeleton. All these structures, most probably interact with cell junctions and cell–substrate adhesion sites. Due to the rapid growth in information, we aim to provide a bird’s eye view focusing on actin filaments in endothelium and its functional relevance for entire cell and junction integrity, rather than discussing the detailed molecular mechanism for control of actin dynamics. The German Research Council, DFG INST 2105/24-1 and SCHN 430/6-1 to H.S. supported this work.